A while ago, I read The Manisis Chronicles: A Novel Of Fantasy Or Prophecy? , a book from the Philosophical Publishing Company. A work of fiction [? ], it does contain esoteric truth and history of the esoteric organization that produced this work. 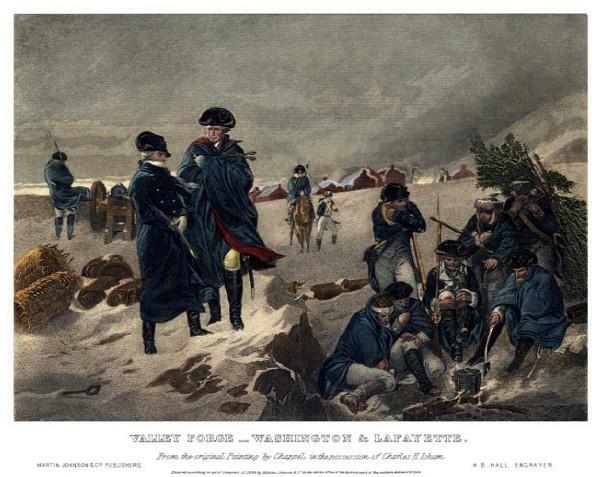 One of the more profound teachings within this book is the story of the vision that George Washington had at Valley Forge in the winter of 1777 while fighting British forces. The vision outlines three significant trials that the nation will endure through time. It starts with the Revolutionary war in his time, and progresses through the Civil war. There is another, future conflict mentioned. “A new influence, mysterious, potent, irresistible, took possession of me. All I could do was to gaze steadily, vacantly at my unknown visitor, Gradually the surrounding atmosphere seemed as if it had become filled with sensations, and luminous. Everything about me seemed to rarefy, the mysterious visitor herself becoming more airy and yet more distinct to my sight than before. I now began to feel as one dying, or rather to experience the sensations which I have sometimes imagined accompany dissolution. I did not think, I did not reason, I did not move; all were alike impossible. I was only conscious of gazing fixedly, vacantly at my companion. “Presently I heard a voice saying, `Son of the Republic, look and learn,’ while at the same time my visitor extended her arm eastward. I now beheld a heavy white vapor at some distance rising fold upon fold. This gradually dissipated, and I looked upon a strange scene. Before me lay spread out in one vast plain all the countries of the world; Europe, Asia, Africa and America. I saw rolling and tossing between Europe and America the billows of the Atlantic, and between Asia and America lay the Pacific. “Son of the Republic” said the same mysterious voice as before, “look and learn”. At that moment I beheld a dark, shadowy being, like an angel, standing, or rather floating in mid-air, between Europe and America. Dipping water out of the ocean in the hollow of each hand, he sprinkled some upon America with his right hand, while with his left hand he cast some on Europe. Immediately a cloud raised from these countries, and joined in mid-ocean. For a while it remained stationary, and then moved slowly westward, until it enveloped America in its murky folds. Sharp flashes of lightning gleamed through it at intervals, and I heard the smothered groans and cries of the American people. “A second time the angel dipped water from the ocean, and sprinkled it out as before. The dark cloud was then drawn back to the ocean, in whose heaving billows it sank from view. A third time I heard the mysterious voice saying, `Son of the Republic, look and learn,’ I cast my eyes upon America and beheld villages and towns and cities springing up one after another until the whole land from the Atlantic to the Pacific was dotted with them. Again, I heard the mysterious voice say, `Son of the Republic, the end of the century cometh, look and learn.’ At this the dark shadowy angel turned his face southward, and from Africa I saw an ill-omened spectre approach our land. It flitted slowly over every town and city of the latter. The inhabitants presently set themselves in battle array against each other. 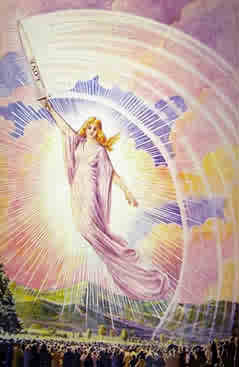 As I continued looking I a saw bright angel, on whose brow rested a crown of light, on which was traced the word `Union,’ bearing the American flag which he placed between the divided nation, and said, `Remember ye are brethren.’ Instantly, the inhabitants, casting from them their weapons became friends once more, and united around the National Standard. Asia and Africa. Then my eyes beheld a fearful scene: from each of these countries arose thick, black clouds that were soon joined into one. Throughout this mass there gleamed a dark red light by which I saw hordes of armed men, who, moving with the cloud, marched by land and sailed by sea to America. Our country was enveloped in this volume of cloud, and I saw these vast armies devastate the whole country and burn the villages, towns and cities that I beheld springing up. As my ears listened to the thundering of the cannon, clashing of swords, and the shouts and cries of millions in mortal combat, I heard again the mysterious voice saying, `Son of the Republic, look and learn.’ When the voice had ceased, the dark shadowy angel placed his trumpet once more to his mouth, and blew a long and fearful blast. Bruington, E.L. (2002). Washington’s Own Words. Creating the New World. The Manisis Chronicles. Philosophical Publishing Company. Quakertown, PA. This entry was posted in Metaphysics & Esoteric, Philosophy, Politics and tagged George Washington, Manisis, Manisis Chronicles, Valley Forge, vision. Bookmark the permalink.